OMG Shrimp Cocktail at Its Very Best! A 6 ‘7″ chef with a flair for home cooking has stolen my food heart. 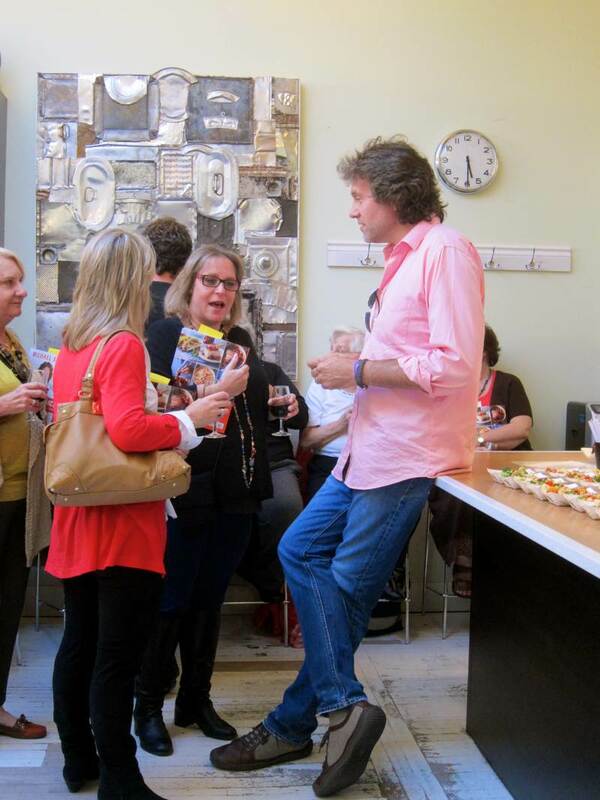 My first attempt to address him at an Appetite for Books appearance led to shy stuttering and a rescue by Montreal journalist Susan Schwartz, who recognized my distress and pitched in with my intended message. He’s very famous, for a Canadian, so I’m sure you all know him and can’t wait for him to steal your food hearts, too. Michael Smith. Look up. Look way up. Look up to his cooking prowess, too, while you’re at it. 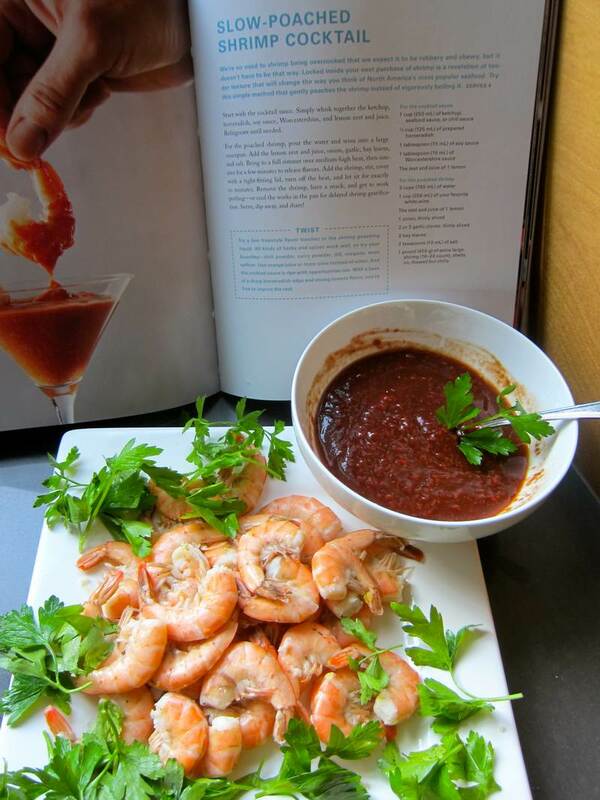 I saw him make this Shrimp Cocktail on his TV show and discovered the recipe in his latest book “Back to Basics.” He makes cooking look simple, and his soothing voice makes you feel welcome and embraced. 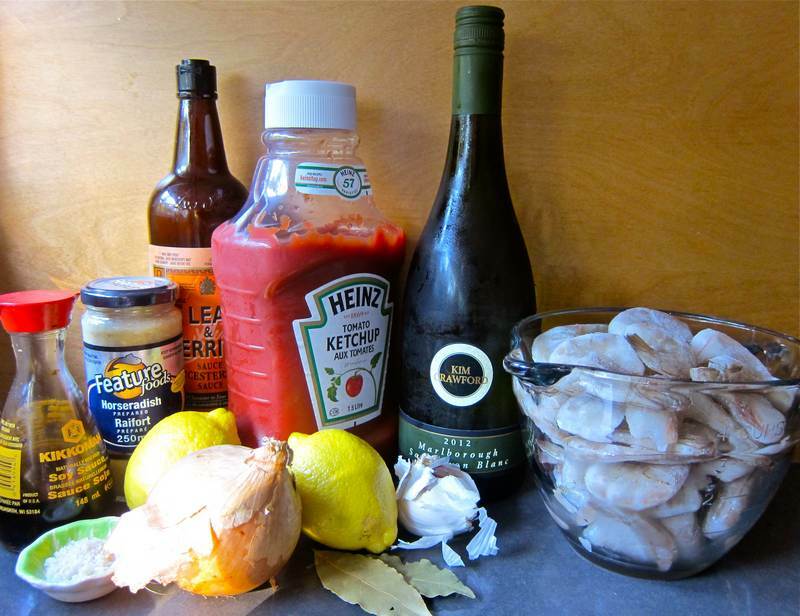 In a medium-sized pot, bring all ingredients except the shrimp to a boil. Simmer for 4 minutes. Add the shrimp and immediately remove the pot from the heat. Cover the pot, and let the shrimp poach for 8 minutes. Strain, plate and refrigerate the shrimp. Peel the chilled shrimp before serving, leaving the tails on. Garnish with parsley leaves and serve with Cocktail Sauce. Serves 6. Combine all ingredients in a small bowl. Refrigerate. Amount is more than double what’s needed for 1 pound of shrimp. The old me figured that shrimp could simply be tossed into boiling water with some lemon for a couple of minutes. The old me could never understand why my shrimp were not flavourful. 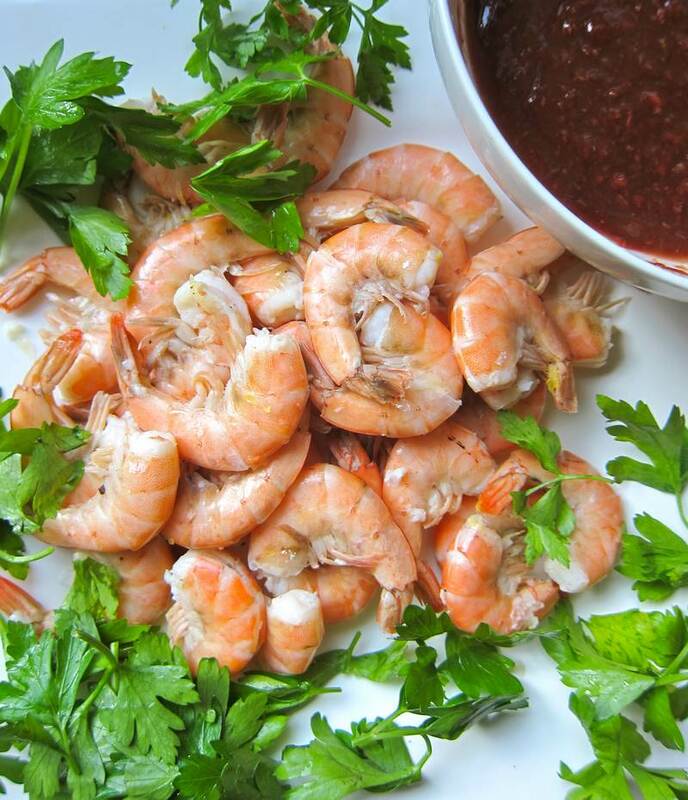 The new jittery me is ecstatic over the aromatic sea flavour of these shrimp. Don’t even ask about the cocktail sauce. Beyond, beyond, beyond perfect. Yep, that’s my food heart talking. Here are 10 ways to kick the toxic sugar habit. Here are 63 inspirational quotes and 10 reasons to get away from home this weekend. Thank you, Michael Smith, for granting me permission to blog away your recipes. Here’s to sharing many wonderful recipes together! There is nothing like a bowl of shrimp cocktail in front of you. How are you cleaning the poop vein out? Carefully? Same way I’ve always done it. It seems to be easy to remove. A paper towel could be helpful. Sounds yummy…definitely must try this! It is yummy! You’ll be glad you did! I will look over your site and think about joining. Thanks for the invitation!